Another impressively large pure silver coin struck by the Perth Mint. This beautifully made 2014 Australian Kilo Silver Koala (32.15 oz) coin falls into the category of what we call “limited edition bullion products”. The Perth Mint will limit production of the 2014 Australian Kilo Silver Koala series to “demand” meaning once they are finished the run is stopped. The actual number available will be determined by public demand. The series of silver coins featuring the Koala bear began at the Perth Mint in 2007. It has continued on a regular basis because of two factors: First the Koala is widely popular and second the Perth Mint pays exquisite attention to minting details. Both of these important investment factors has made the 2014 Australian Kilo Silver Koala coin a hit with the public. 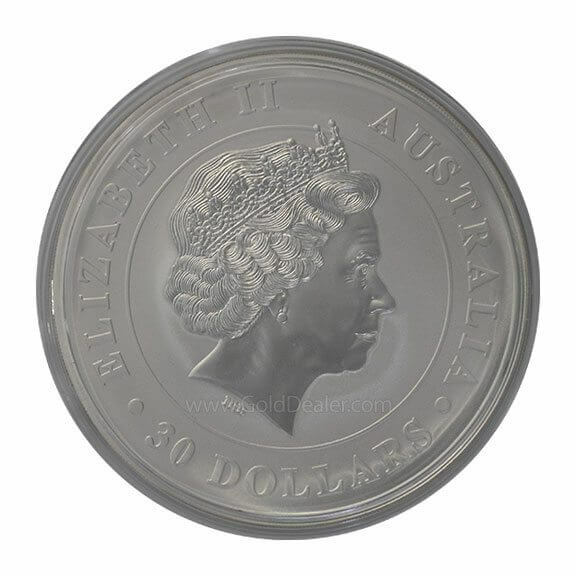 The front of the 2014 Australian Kilo Silver Koala coin features the familiar Queen Elizabeth II and inscriptions include the coin’s legal tender value (30 DOLLARS) and the artists initials IRB (Ian Rank Broadley). The legal tender value is largely symbolic but adds a special plus to the coin and singles it out as being produced by a sovereign nation. 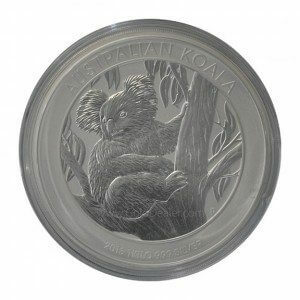 The reverse of the 2014 Australian Kilo Silver Koala features a close up picture of the Koala and eucalyptus leaves. The large P next to the Koala’s ear represents the maker (Perth Mint). And finally the inscriptions include: AUSTRALIAN KOALA and 2014 1 KILO 999 SILVER.